It’s finally cold enough to rock those statement coats and faux fur and I could not be happier! My coat collection is ever growing and with the amazing choice on the high street I just can’t resist them! 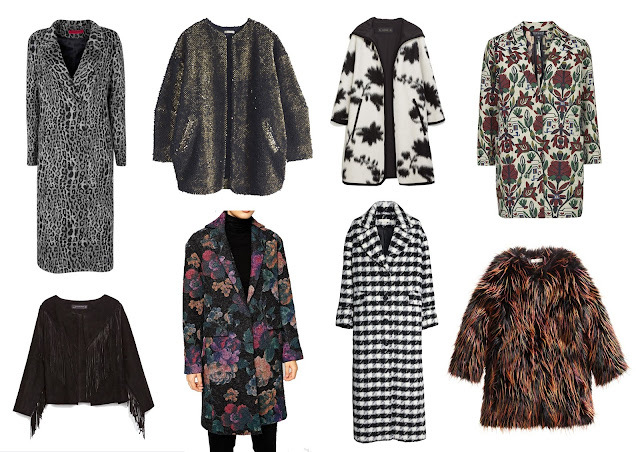 Here are my top 8 coats I need in my life this season, I hope you like them too! This is a great addition to any girls wardrobe and has such a cute update on a staple boyfriend coat with the leopard print. Good old Boohoo! Everyone needs a bit of sparkle this time of year so why not push it to your outwear! Perfect for teaming with your party dresses and heels! This wool cape from Zara is the perfect pull over to team with your chunky knits and winter boots. I love the floral shadow print which is really on trend for AW14, being warm never looked so good! The most perfect floral printed coat to make a statement this season! It will look great with over the knee boots a roll neck and a mini skirt! I wear my H&M fringe jacket to death and have been looking for an update. This Zara one is definitely the answer and will be great for all year long! Tassle-tastic! Another great printed jacket that will look great with your winter essentials! I love all the pretty colours in this one and adds a bit of interest to those grey winter days! I love the dramatic length and all over monochrome print of this jacket. I just think it’s a perfect winter statement and can be worn with the most simplest of outfits and look great. I’m all about the crazy faux fur’s and this one is totally my new favourite! I love all the rich colours running through it, of course H&M have smashed it again! Hublot wrist watches tend to be acclaimed for his or her various rolex replica which arranged all of them very far through abounding additional types of wrist watches. Every fake hublot is done having a turning deejay agreement that's dependable as well as replica watches sale. It offers the hublot replica actual individual by having an recommend method to admeasurements period. The actual suitable view has got the hr fight hublot replica out which orbits concerning the strong history. The actual rolex replica obvious utilizes hard disks rather than this particular recognized method of creating wrist watches. The actual custom tag heuer replica watches for sale tend to be the best options associated with reproduction wrist watches on the web.